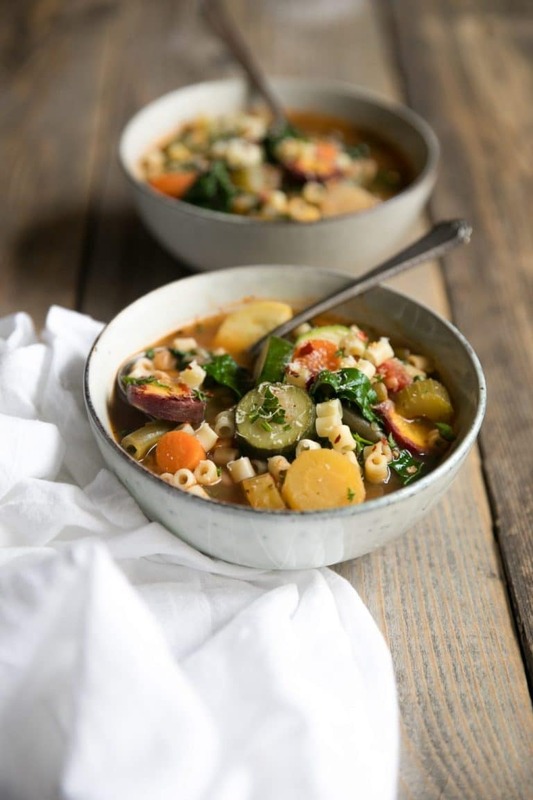 Packed full of fresh and seasonal vegetables, Minestrone is a comforting Italian vegetable soup made with beans, pasta, and a nourishing tomato-based broth. 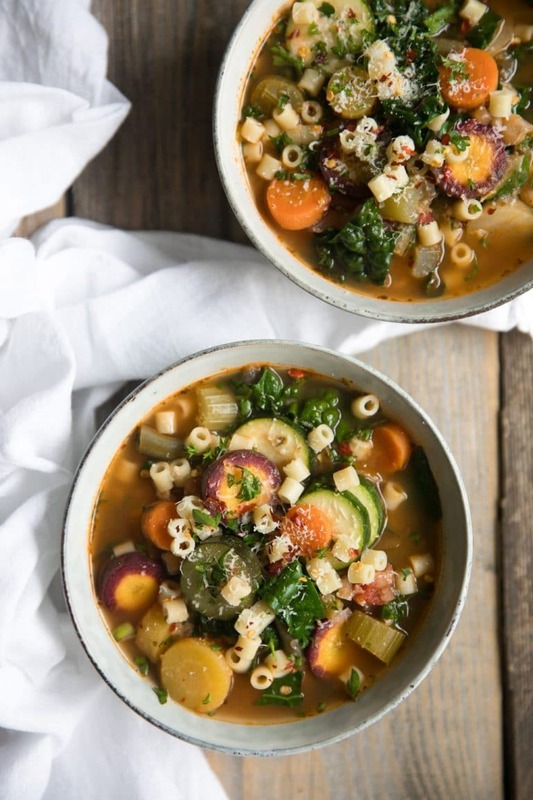 This hearty, vegetable-filled, Homemade Minestrone Soup Recipe is the perfect anytime healthy solution to beat the chilly winter months. Minestrone Soup is all about feeling warm, snuggly, and adding up all those leftover dying vegetables waiting to be used before heading to the bin. 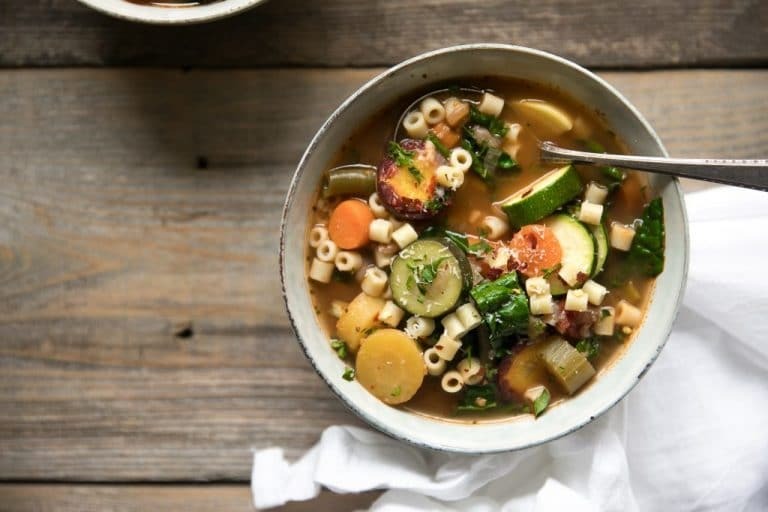 Easily made on the stovetop or in your slow cooker, this Minestrone Soup Recipe guaranteed to become your new soup bff. With its roots in Italy, Minestrone is famous for having loads of vegetables and usually some kind of pasta. Other frequent ingredients include tomatoes, beans, onion, celery, and carrots. With that said, there is no set recipe or definition for Minestrone. Typically made with whatever vegetables were available or in season, not all Minestrone soup recipes are created equally. And though many Minestrone recipes are vegetarian, this is not a requirement, as meat or a meat-based broth is often added. 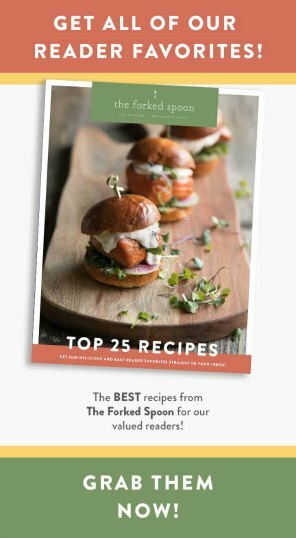 Rather than give you a list of every single ingredient in this particular recipe (you can find that in the recipe card below), I’m going to give you a list of the most common ingredient found in Minestrone Soup. Add the olive oil to a large Dutch Oven or stockpot and add the onion. Cook the onion for 3-4 minutes, or until fragrant and translucent. Stir often. Add the chopped carrots and celery to the onions and stir to combine. Cook for 5 minutes. The vegetables will not be cooked at this point- don’t worry. Add the minced garlic, dried oregano, basil, parsley, rosemary, red chili flakes, and tomato paste to the vegetables and mix well to combine. Cook, stirring constantly, for 1 minute. Add the green beans, diced tomatoes (with juices), vegetable broth, cannellini beans, and red kidney beans to the pot. Stir well to combine. Cover and bring to a low boil. Reduce heat to low and simmer for 15-20 minutes. Prepare the pasta (see notes). In the meantime, bring a separate large pot of water to a boil over high heat. Cook your ditalini pasta according to package instructions until al dente (aka just slightly undercooked). Drain, rinse with cold water and set aside. Once the longer-cooking root vegetables and green beans are cooked, add the chopped summer squash, kale, parsley, and lemon juice to the pot. Stir well to combine and simmer for 5 minutes. Season your soup with additional salt, pepper, or herbs, if desired. Serve. 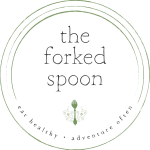 Fill bowls with approximately 1/2 cup cooked ditalini pasta and ladle with soup. Garnish with parmesan cheese and fresh chopped cilantro, if desired. To prepare this soup in the slow cooker you will basically dump all the ingredients in your crockpot except for the pasta noodles, cilantro, and parmesan cheese. Set your slow cooker to low and let it do its thing for 7-8 hours. Approximately 20 minutes before serving, I recommend boiling your noodles separately and adding to each bowl as desired. Depending on which vegetables you add, just keep in mind that after 7-8 hours of cooking they may lose their shape. For example, squash and celery when cooked for long periods of time turn mushy. The soup will still taste delicious, however, the vegetables may be somewhat more incorporated into the broth. Oh yes, one other thing. Should you decide to try Minestrone soup in the crockpot, I highly recommend adding a leftover rind from a wedge of Parmesan cheese. This will add so much flavor! It’s something I do whenever I make homemade pasta sauce and it’s equally delicious in tomato-based soups. It’s fast. Start to finish you can have a big beautiful pot of this soup on your table in under one hour. When you consider how long some soups take to make, this is no time at all! Leftovers are fantastic! Guys, trust me, you want leftovers. Leftovers for lunch, leftovers for dinner, Minestrone leftovers are always a brilliant idea. Especially if you boiled your noodles separately so they didn’t have a chance to turn soggy. Versatility. Stovetop or crockpot? you decide. What about vegetables? Just because I added kale doesn’t mean you have to add kale. Minestrone is all about YOU. Make it how you want it! Helps eliminate waste. 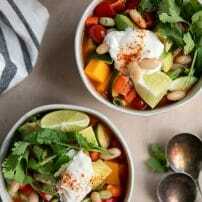 Minestrone Soup is one of my favorite refrigerator cleanout recipes. I always have carrots, celery, and onion that need to be used up and I can guarantee that I have canned tomatoes, tomato paste, and a handful of other perishable vegetables about to head to the bin. Soup is the best way to help but back on waste. It’s super budget-friendly, too! Minestrone wants you to be healthy. 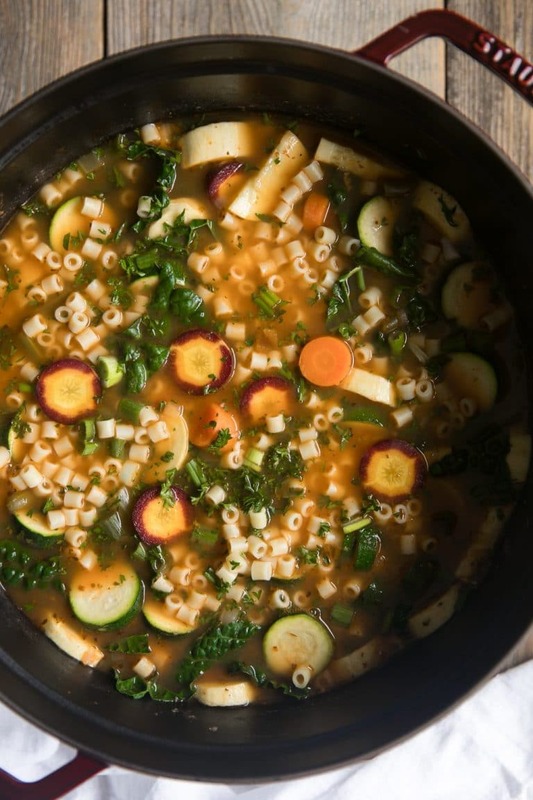 Ok, this may be a stretch, BUT, Minestrone soup is, in fact, insanely good for you. I mean, vegetables. 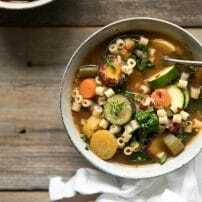 If you try making this Homemade Minestrone Soup Recipe, please leave me a comment and let me know! 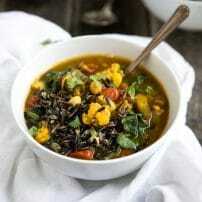 I always love to read your thoughts and feedback and would love to hear which vegetables you used to make this soup! 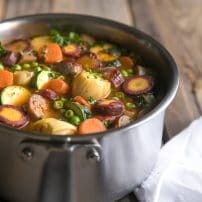 DON’T FORGET TO PIN AND SHARE THIS EASY AND DELICIOUS MINESTRONE RECIPE TO ENJOY AND SERVE WITH YOUR FAVORITE VEGETABLES. Packed full of fresh and seasonal vegetables, Minestrone is a comforting Italian vegetable soup made with beans, pasta, and a nourishing tomato-based broth. Onions, carrots, celery. Add the olive oil to a large Dutch Oven or stockpot over medium heat. Add the diced onion and stir to combine. Cook the onion for 3-4 minutes, or until fragrant and starting to turn translucent. Stir often. Add the chopped carrots and celery to the onions and stir to combine. Cook for 5 minutes, stirring occasionally. Garlic, herbs, tomato paste. Add the minced garlic, dried oregano, basil, parsley, rosemary, red chili flakes, and tomato paste to the vegetables and mix well to combine. Cook, stirring constantly, for 1 minute. Beans and broth. Add the green beans, diced tomatoes (with juices), vegetable broth, cannellini beans, and red kidney beans to the pot. Stir well to combine. Simmer. Cover and bring to a low boil. Reduce heat to low and simmer for 15-20 minutes. Prepare the pasta (see notes). In the meantime, bring a separate large pot of water to a boil over high heat. Cook your ditalini pasta according to package instructions until al dente. Drain, rinse with cold water and set aside. Add the more delicate vegetables. Once the longer-cooking root vegetables and green beans are cooked, add the chopped summer squash, kale, parsley, and lemon juice to the pot. Stir well to combine. Season to taste. Season soup with additional salt, pepper, or herbs, if desired. Serve. Fill the desired number of bowls with approximately 1/2 cup cooked ditalini pasta and ladle with soup. Garnish with parmesan cheese and fresh chopped cilantro, if desired. Enjoy! Dump all the ingredients in your crockpot except for the pasta noodles, cilantro, and parmesan cheese. Set your slow cooker to low and cook for 7-8 hours. Approximately 20 minutes before serving, bring a large pot of water to a boil. Add the pasta and cook according to package instructions. Fill the desired number of bowls with approximately 1/2 cup cooked ditalini pasta and ladle with soup. Garnish with parmesan cheese and fresh chopped cilantro, if desired. Enjoy! I almost always cook my pasta separately to prevent the noodles from getting soggy. If you prefer to cook your pasta directly in the soup, that's fine, too. Simply add the noodles 5-8 minutes before desired serving time. Feel free to use any pasta you like! I love ditalini pasta for soups because it holds its shape well and is easily scooped with a spoon. 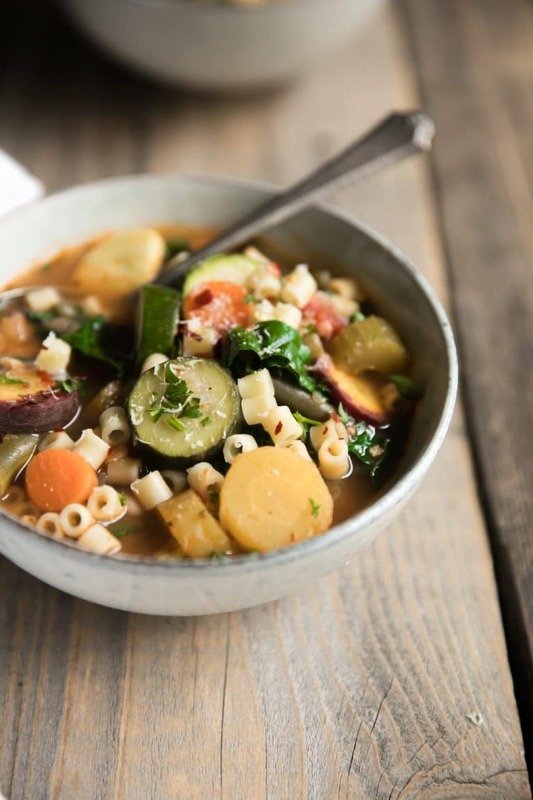 Traditional Minestrone soup recipes were used as a way to use up old, leftover vegetables. Feel free to use whatever vegetables you have on hand! To make Dairy-free/Gluten-free: Do not garnish with Parmesan cheese. 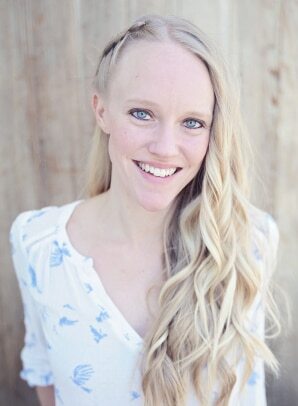 To make Gluten-Free: Substitute the noodles for your favorite gluten-free noodle or add rice instead.